Ayondo is a forex broker. 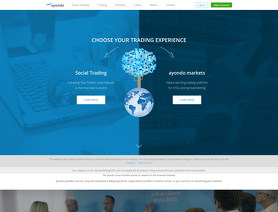 Ayondo offers the Mobile trading currency platforms. Ayondo.com offers over 35 currency pairs, stocks, index, commodities and cfds for your personal investment and trading options. Great support, quick withdrawal, nice traders. Can't believe I am first to leave review of Ayondo!